If you're in the market for an action cam you'd be remiss to not consider options other than industry juggernaut GoPro. With their Apex HD + Wi-Fi camera / goggles and the Ego HD Liquid Image has action camera options for any sport you're into. When you mention action cameras, everyone automatically thinks of GoPro. And while the GoPro Hero 3 is no slouch, the silver edition is a whopping $299.99. The higher end Black Edition is a jaw-dropping $399.99! Enter Liquid Image and their diminutive Ego HD action camera. With an MSRP of $179.99 (you can even find it for much less with some digging), the Ego HD makes for a fine alternative to the more trendy and costly GoPro Hero 3. 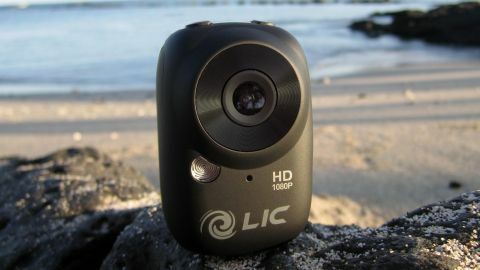 Described by Liquid Image as "a mountable HD Action Camera," the Ego is able to record HD 1080P video up to 30 fps and HD 720P up to 60 fps. In addition to video the Ego HD records 12MP images one at a time as well as in continuous mode. In our tests we particularly liked the continuous mode as you can simply hit the shutter button and let the little Ego do its thing. That said, when you return to the cabin be prepared to view a lot of photos that are more similar than dissimilar. The Ego HD uses a class 6+ Micro SDHC card up to 32GB. While this is sold separately Micro SDHC cards a relatively cheap these days. According to Liquid Image a 4GB card records about two hours of video and this was consistent with our tests. Also expect to get around 1,000 for every 1GB of memory added. While you can record about two hours of video with a 4GB Micro SDHC, this brings up another issue. The rechargeable lithium battery isn't removable and it only lasts for anywhere from 1.5 to 2 hours in HD video mode. While the GoPro Hero 3 can be finicky to use its battery is removable so you can bring a pocket full of them with you as you hit the slopes or whatever it is you're into. When testing the Ego HD at Squaw Valley and Alpine Meadows near Lake Tahoe, CA we had to bring a charger along to periodically keep the Ego HD up and running. Similar to other action cameras the Ego HD uses Wi-Fi to connect to your smartphone. There are two software options available and both are compatible with iOS and Android. We tested the Ego HD with a Samsung Galaxy Note 2 as well as an iPhone 5. The Liquid Image app enables you to tweak settings on the camera. For instance, while the Ego HD records 12MP still images the camera actually sports a 3MP sensor. That 12MP number is actually an interpolated resolution. Using the app you can configure the camera to record 3MP or 5MP still images. In addition to those tweaks, seeing how limited the Ego HD's display is, it's nice that you can use the app to change other settings like exposure modes, white balance, contrast, and field of view. The Ego HD can shoot anywhere between 135 and 90 degrees and you can adjust this from within the app. You can also adjust the mic level which we found tremendously helpful. On the ride up the lift it's fun to record your conversations with your ski buddies. But on the descent all you're really gonna pick up is wind noise. While the Liquid Image app is useful for setting up your Ego HD, it's not the best for actually shooting. For that the free third-party Action Connect app is best. Wi-Fi enabled action cameras, including the GoPro Hero 3 have a noticeable lag when using your smartphone to control the camera. The lag with Action Connect is pretty bad but the additional functionality makes it worth it.